Were you there for the hottest tour of 1985? Rusty the European Tour! Features a vintage worn look. 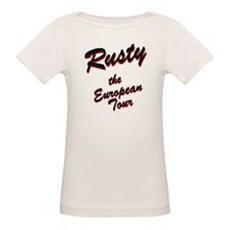 We've got an awesome collection of Rusty the European Tour T-Shirt, shirts, hoodies, gifts and more. 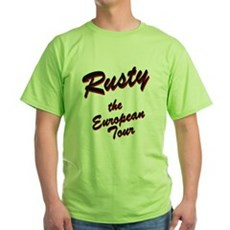 We specialize in Rusty the European Tour T-Shirt tees and many more funny, vintage and retro t-shirts. Featuring original and classic Movie T-Shirts, Movie Quote Shirts and TV T-Shirts you won't find anywhere else. All orders come with a 30 day money-back guarantee and most ship within 24 hours.